An MCASE approach to the search of a cure for Parkinson's Disease. Parkinson's disease is caused by a dopamine deficiency state in the fore brain area. Dopamine receptor agonists, MAO-B inhibitors, and N-Methyl-D-Aspartate (NMDA) receptor antagonists are known to have antiparkinson effect. Levodopa, a dopamine structural analog, is the best currently available medication for the treatment of Parkinsons disease. Unfortunately, it also induces side effects upon long administration time. Thus, multidrug therapy is often used, in which various adjuvants alleviate side effects of levodopa and enhance its antiparkinsonian action. Computer models have been created for three known antiparkinson mechanisms using the MCASE methodology. New drugs for Parkinsons disease can be designed on the basis of these models. We also speculate that the presence of biophores belonging to different groups can be beneficial and designed some potential drugs along this line. The proposed compounds bear pharmacophores of MAO-B inhibitors, dopamine agonists and NMDA antagonists, which could synergistically enhance their antiparkinson effect. The methodology could readily be expanded to other endpoints where drugs with multiple activity mechanisms would be desirable. Parkinson's disease (PD) is the prevalent neurodegenerative disorder of adults and is believed to be due to a dopamine deficiency state in the fore brain area. It is caused by the death of more then 75% of mid brain dopamine producing neurons. Tremor, rigidity, and akinesia characterize the disease. Genetic and environmental factors are believed to initiate Parkinson disease. The environmental theory of PD recently received strong support from the work of Greenamyre et al..
At present there is no satisfactory medication for the treatment of PD. Levodopa, which is a dopamine structural analog is the "golden standard" in PD, but its side effects upon long term administration (dyskinesia, dystonia, etc, ) compel the search for drugs with better pharmacological profiles. Other dopamine (DA) agonists do not provide adequate therapeutical response . Thus, multidrug therapy is usually often used. In this therapy various adjuvants alleviate side effects of levodopa and enhance its antiparkinsonian action. Three main groups of compounds were found to have antiparkinson effect. These are dopamine (DA) receptor agonists, MAO-B inhibitors, and N-Methyl-D-Aspartate (NMDA) receptor antagonists . The monoamine oxidase enzyme exists under two forms, MAO-A and MAO-B. Dopamine is oxidized in the brain by the MAO-B form. MAO-B inhibitors maintain dopamine concentration by blocking the MAO-B enzyme, whose activity is also known to increase with age . In addition, MAO-B inhibitors can block the formation of toxic metabolites from the compounds that are capable to cause PD (e.g. MPTP ). The beneficial action of DA agonists is based on direct stimulation of the DA receptors. There are two classes of dopamine receptors: D1 (D1, D5 subtypes) and D2 (D2, D3, D4 subtypes). The antiparkinson action of dopamine agonists was found to be mainly due to the stimulation of the D2-class receptors . Therefore we favored in the present work those DA agonists that exhibit at least moderate activity toward D2-class of DA receptors. NMDA antagonists were observed to enhance the therapeutic effects of dopaminomimetics in PD. They block the glutamatergic (excitatory) pathways that are overstimulated in PD . Such action decreases the influx of calcium ions into the neuron, and hence downregulates the activation of calcium dependent enzymes. This can prevent the neuronal excitotoxic damage. We set to identify the pharmacophores responsible for each of these pharmacological activities so as to provide guidelines for the synthesis of new and possibly more potent analogues. We also speculated that better drugs could be identified that contain more than one biophore, possibly providing activity at multiple sites. We therefore designed some potential drug by grouping several biophores into a single molecule, thereby creating a single molecule cocktail of drug activity. The use of such a drug might reduce side effects stress imposed on the patients, while the synergy of its effects might improve overall response. Information about available MAO-B inhibitors [8–11], DA agonists [12–15], and NMDA antagonists [16–19, 38–40] was collected from literature sources. Their structures were coded and three separate databases (MAO inhibitors, DA agonists, and NMDA antagonists) were created and submitted to analysis by the MCASE program. MCASE is a powerful analysis tool, whose principles have been described in detail elsewhere . Basically the program works with databases of structurally diverse compounds, where each entry contains the structural formula of a molecule and its activity in a specific endpoint. MCASE looks for key-features that may be responsible for the observed activity of the compounds of the database. The basic idea is that if a substructure is related to the observed activity, it will be found mainly in active and marginally active compounds. On the other hand, if it is not relevant to the observed activity, it will be randomly distributed amongst active and inactive compounds of the database. The substructures that are seen to be responsible for activity are called biophores, which in the case of pharmacological process are basically the pharmacophores. The compiled databases contain qualitative data about compounds. Our MAO inhibitors database used data from Kalgutkar  and others. It consists of compounds tested as potential MAO inhibitors. Two strategies were tried with this database. In the first approach, the selectivity of MAO-inhibitors was used as the main criterion ("Selectivity database"). Hence, the preferable MAO-B inhibitors were treated as "actives", while MAO-A inhibitors where entered as "inactives", and unselective MAO inhibitors as compounds of "marginal activity". In the second strategy, only the actual activity of inhibitors towards MAO-B form was considered ("Activity database"). Under these conditions all compounds that inhibit the MAO-B enzyme were treated as "active" and the others as "inactive". More details will be given later during the discussion of the specific databases and their biophores. For the DA database obtained from the paper by Seeman  and others, agonists are listed as "active", while antagonists are entered as "inactive". Partial agonists are seen as compounds with "marginal activity". The third database contains information about NMDA antagonists and includes compounds collected from various reports ([16, 21] and others). The database was created as follows: NMDA antagonists were set as "actives", NMDA agonists as "inactives" and partial agonists as "marginally actives". In addition, to ensure that databases built on the bases of selectivity also possess structural information about the corresponding generic activities (binding to the NMDA or DA receptors, inhibiting both MAO isoforms), active compounds were required to have low Ki (the dissociation constant of the molecule-receptor (enzyme) complex). Models were created automatically by the MCASE program for each of these databases. These models were tested for robustness and reliability. In order to estimate the quality of the models "ten-off validation procedures were performed for each database. In these validation procedures, ninety percents of all compounds from a database were selected randomly and used as learning set to create a "reduced" model. The remaining ten percents of molecules ("test set") were then tested against the reduced sets to evaluated the predictive power of these models. Three trials often-off validations were performed for each database. The results are shown in Table 1.
a Ability to predict active compounds correctly b Ability to predict inactive compounds correctly c The percentage of Observed Corrected Predictions (OCP) d Probability for an unknown compound to receive a statistically satisfactory prediction. As can be seen, good predictions, i.e. high concordance and wide coverage (almost all chemicals from the test sets received a prediction) were obtained for all databases. The ability to recognize active compounds was slightly better (by about 5%) for the DA database, whereas for the MAO-B and the NMDA databases the situation was reversed. In fact, we prefer to underpredict activity (i.e. some experimentally active molecules being predicted to be inactive) rather than overpredict it (when some experimentally inactive molecules are predicted to be active), since overprediction can lead to the design of drug candidates that lack efficacy. Overall, high coverage and good predictive power by all models indicated that the database's biophores are not products of chance-correlation, but are relevant to the specific activity types they represent. As an additional validation, each model was tested with a large group of structurally diverse molecules, which were taken from the FDA rodent carcinogenicity database . Results (Table 2) demonstrate good specificity of the models. Number of predicted "active" compounds with unaccounted activity is low (approximately 1% for the NMDA and DA database and even less for the MAO-B databases). The most reliable biophores from each model were then selected as initial structural elements for the construction of new drug prototypes. IC50, the concentration of inhibitor that decreases enzyme activity by 50%, does not provide sufficient mechanistic information as it depends on the conditions of the experiment . Therefore it cannot be used to compare mechanistically diverse data as in our case. Instead, we used Ki, the dissociation constant of the enzyme-inhibitor complex, to compare the activity of different inhibitors. Indeed, this is a better indicator of a molecule's potential to reversibly inhibit the enzyme. Furthermore reversible inhibitors are less likely to cause enzyme malfunction  than irreversible ones. As mentioned earlier the selective and reversible inhibition of MAO-B versus that of MAO-A is the major criterion used to create the "Selectivity database" (Table 1). Chemicals with a ratio greater than 10 were considered to be selective MAO-B inhibitors and therefore were used as "active" entries, while compounds with a ratio less than 0.1 were considered to be selective MAO-A inhibitors and thus "inactive". 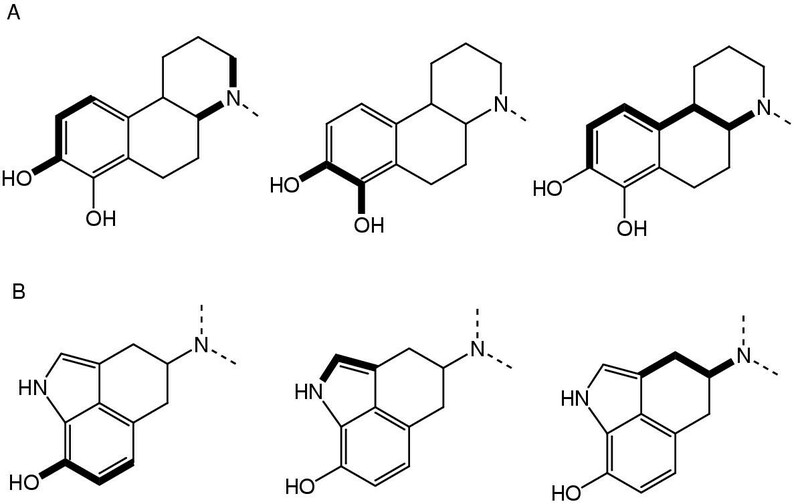 MAO inhibitors which ratio was within 0.1–10 range were considered as unselective MAO-B inhibitors and were treated as "marginally active" molecules. In the "Activity database" (Table 1), inhibitors with a Ki (MAO-B) value less than 1 μM were treated as "active", while compounds with a Ki (MAO-B) value in the 1–5 μM range were treated as "marginally active" molecules. All those with a Ki (MAO-B) larger than 5 μM were entered as "inactive". The biophore should have a high probability to be relevant to activity (PRA). The lowest acceptable PRA value was 75%. A sufficient number of molecules should contain the selected biophore. The biophore should be present in at least 10 compounds. 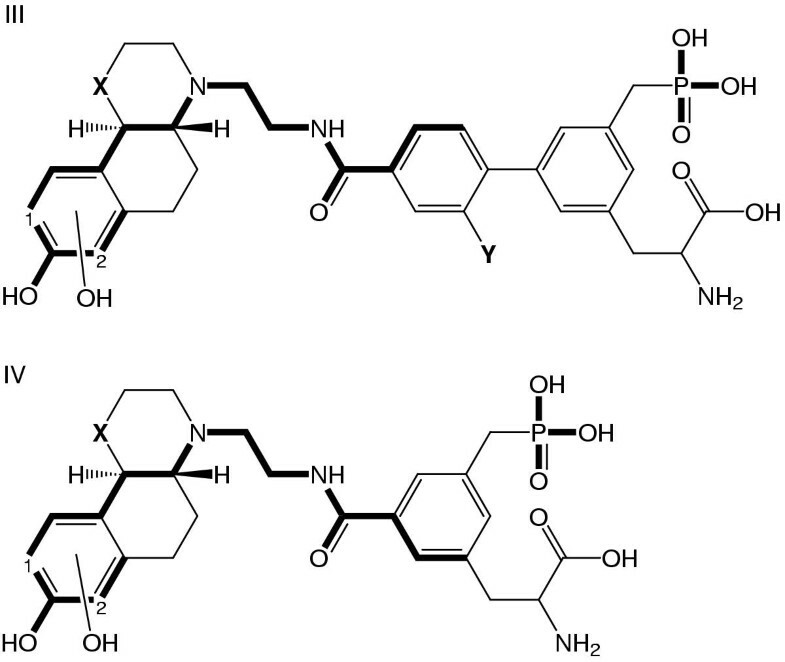 Analysis of biophores #1, #2 (#4, #5) showed that both of them occur in substituted 5-[4-(benzyloxy) phenyl]-1,3,4-oxadiazol-2-(3H)-ones and their analogs (Figure 1), many of which are known to be strong MAO-B inhibitors . Biophore #2 represents a flexible -CH2O- bridge between aryl moieties and was found to enhance the activity and selectivity of the inhibitors as shown in the original work . Biophores #1 and #2 include aromatic moieties, whose main function is presumably to bind to the hydrophobic site of MAO. Biophore #3 (#6) exists in N-(2-Aminoethyl)-benzamides with substitutions on the aryl ring. 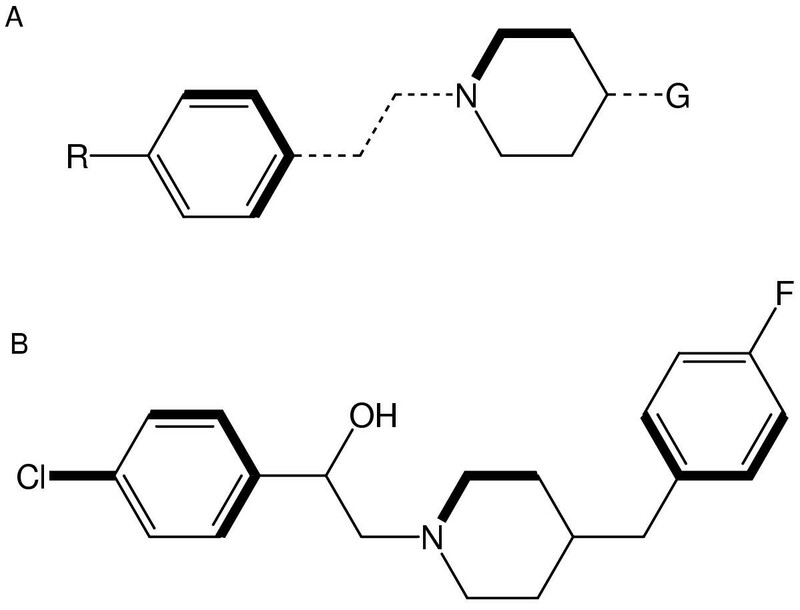 These compounds are known to be time-dependent inhibitors of MAO-B . Several QSAR and CoMFA analyses were published, reporting relevant properties and structural parameters that govern MAO inhibition [23–26]. All of them were performed for narrow data sets and hence the results were confined to the same group of compounds. We used these studies to confirm the relevance of some of our biophores. For example, biophore #2 was found to be an important factor enhancing the interaction between the inhibitor and the protein core of the MAO enzyme [23, 25, 27]. The NMDA receptor consists of two subunits that together create a membrane channel. Each subunit belongs to the NR1 or NR2 subunit family. Various splice variants are also known . Activation of the NMDA channel requires that glutamate and glycine bind at the same time to NR2 and NR1 subunits respectively. Thus, three main types of NMDA antagonists are known: glycine-site antagonists (binds to NR1 subunits), glutamate-site antagonists (binds to NR2 subunits) and channel-blockers. In order to avoid unwanted side effects, NMDA antagonists should have either low affinity for the NMDA receptor (e.g. amino-adamantane derivatives) or bind with high selectivity to one type of NMDA receptor (e.g. ifenprodil, eliprodil, or similar compounds) . The chemicals used in the NMDA database were required to have significant affinity for the NMDA receptor. For that purpose, Ki (the dissociation constant of the molecule-receptor complex) of accepted NMDA antagonists was required to be less than 5 μM. The same criteria were used in the selection of the best biophores from the NMDA model as were described in the case of the MAO databases (Biophores #7–10, Table 3). Biophore #7 features the glutamate-binding site of NMDA antagonists (Figure 2). The molecules that contain it are derivatized amino acids, whose phosphonate group is a functional replacement of the γ-carboxyl group of glutamic acid. The phosphonate group of the NMDA antagonist binds to the glutamate-receptor, as does the natural agonist glutamic acid, but no conformational change that activates the NMDA channel occurs . Beart et al  performed a SAR analysis of this type of NMDA antagonists. They report a deep hydrophobic pocket (good for binding of the class of compounds shown in Figure 3B) and a region to accommodate the ω-phosphonate-group (biophore #7 binding site)  as structural-features of the binding site of NMDA competitive antagonists. The generic structure of these NMDA antagonists is shown in Figure 2. Generic structure of NMDA antagonists with biophores #8 and #9 (A). Where G is a hydrophobic group and R is Cl, F, OH, or CH3. The shown compound (B) is illustrative of eliprodil derivatives. Thickened lines represent biophores #8, #9, and #10. Biophores #8 and #9 are characteristic of the NMDA channel blockers. Biophore #8 features an aromatic residue that presumably binds to the hydrophobic pockets of the channel walls (e.g. Triptophan-593, Alanine-627 ). The nitrogen of biophore #9 can contribute to activity possibly by interacting with the negatively charged residues or by forming hydrogen bonds (e.g. Asparagine-598 ). 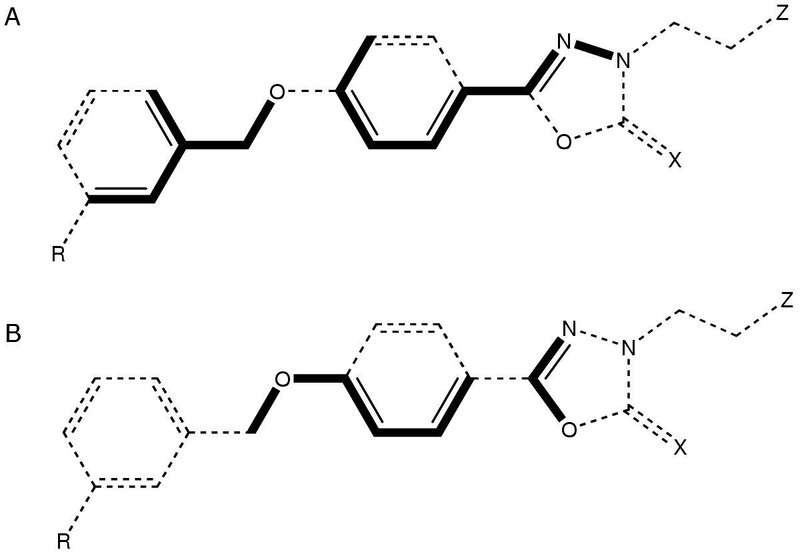 Figure 3A) shows the generic structure of an NMDA antagonist that carries biophores #8 and #9 and B) the relative locations of biophores #8, #9 and #10 in the eliprodil molecular family. Biophores #8, #9, and #10 also occur in the NMDA antagonists that bind to glutamate-binding site of NMDA receptor (e.g. #8 in SDZ EAB 515, #9 in SDZ EAA 494, #10 in SDZ 220-581, [21, 37]). Thus the NMDA biophores that were identified actually characterize two groups of NMDA antagonists: channel blockers and glutamate-site antagonists. The same strategy was used to create the Dopamine agonists database as was used for the NMDA database. Compounds with substantial affinity for dopamine receptors (Ki within nanomolar range) were collected. The best biophores were selected using the same criteria as those used to assess the NMDA and the MAO databases (Table 3 #11–16). Biophore #12 identifies the ortho hydroxyl groups of the catechol ring, which is one of the structural features of dopamine and its derivatives. 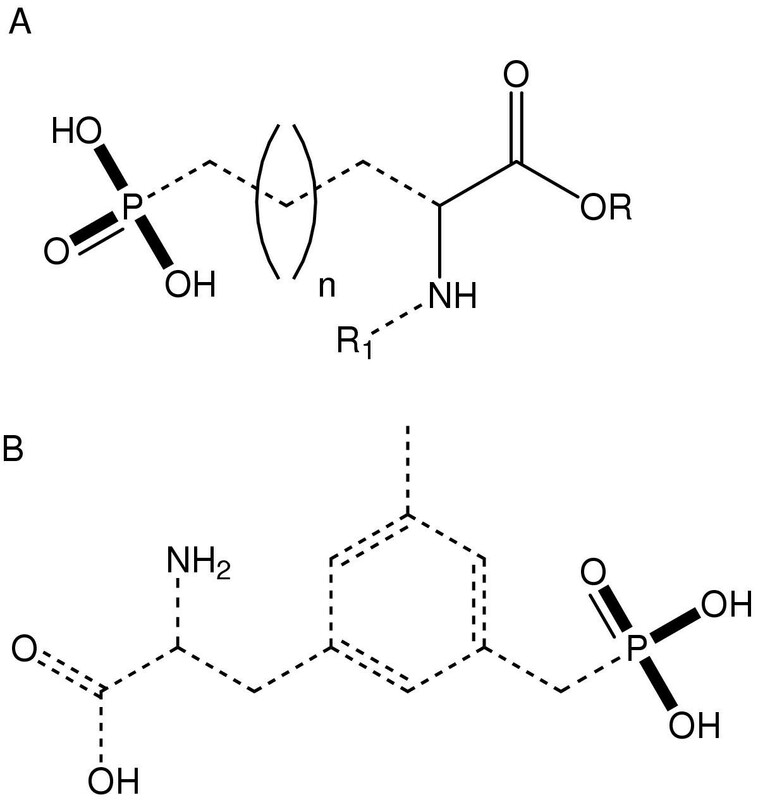 Biophore #11 describes agonists that possess only one hydroxyl, in meta-position (preclamol, RU-24213, RU-24926, etc). This biophore demonstrates the relative importance of the meta-hydroxyl group as compared to the para-hydroxyl group. For example meta-tyramine's binding affinity to the dopamine receptor is significantly greater than that of para-tyramine . Biophores #14 and #15 characterize DA agonists without hydroxyl groups in the aromatic ring. Putatively, the aromatic nitrogen of this biophore carries the function of the meta-hydroxyl group since it has the same structural location relatively to the phenylethylamine backbone. Most of the compounds that contain biophore #13 (9 out of 12 active compounds) also carry a hydroxyl group (Table 3). The majority of compounds that contain biophore #16 also have at least one hydroxyl in one of the three possible branching positions (Table 3). 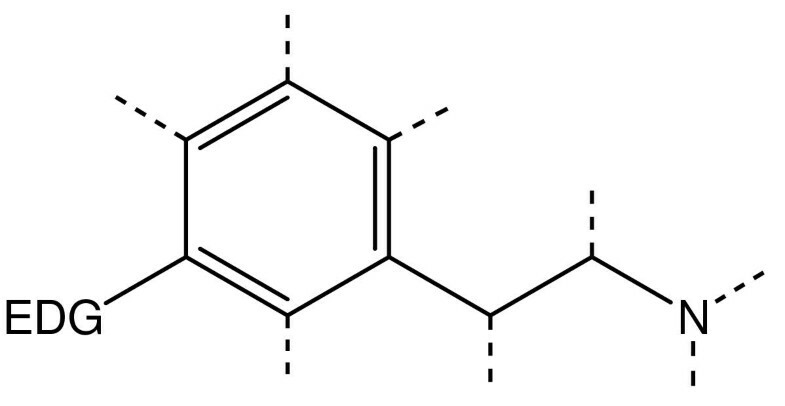 Metabolites of such compounds might be more active than the parent compound. Thus, aromatic hydroxylation of such compounds at the ortho-position would form a catechol ring (Table 3, #12) and produce metabolites that are structural analogues to dopamine. Both biophores #13 and #16 represent dopamine-like agonists that have restricted conformation for the sake of enhanced binding. Based on the biophores that were identified by the program, a generic structure of the DA agonist was constructed (Figure 4). The specifications for such structure include a nitrogen atom separated by two carbon atoms from an aromatic moiety and containing an electron donating substituent at the meta-position. The importance of this backbone finds support in a number of QSAR and CoMFA analyses as well [30, 31]. Generic structure of the dopamine agonist. Broken lines imply possible branching, solid lines show the backbone structure. EDG is an electron-donating group. To ensure compatibility we compared biophores and biophobes (fragments that are found to be responsible for molecular inactivity) across all three databases and found no collisions. On the contrary, structural overlap between some biophores across the three databases was observed. This was used as an additional encouragement to select them for inclusion in prospective new drugs. The modeling procedure requires the construction of precursor candidates (precursor here is a molecule designed to have a single mechanism of antiparkinsonian action) on the basis of selected and compatible biophores of each database. Precursor candidates for NMDA antagonism, MAO-B inhibition and DA agonism were drawn to be within the context of the types of molecules they are derived from. The precursor structures that were generated were then merged into candidate drug molecules. 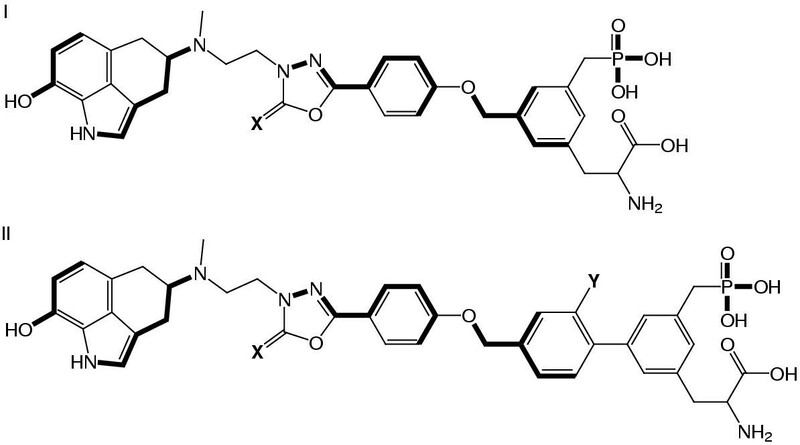 Two types of precursors of active MAO-B inhibitors were identified. The structure of the first one is shown in Figure 1 (1A and 1B) as a generic moiety. The second one is based on a class of compounds that contain biophore #3, whose structure is shown in Table 3 (Biophore #3). The latter precursor has the advantage of small size and its activity is quite tolerant to derivatization at the para-position , whereas the former is known to have high oral bioavailability and low toxic effects in rats . A possible way of derivatization of the compound in Figure 1 (X = O, Z = CN, R = H) is substitution at the terminal aromatic ring. Analysis of the original work  shows that such substitution decreases binding affinity. However, the decrease in activity is acceptable for methyl and methoxyl substitutions in meta- and para-positions. Thus, the IC50 of the unsubstituted compound is 2.2 nM, whereas the meta-methylated analog has an IC50 of 8 nM; the value for the para-methylated is 15 nM, that of the para-methoxylated is 27 nM, and the IC50 of the meta-methoxylated derivative is 29 nM . There are many possible choices for the selection of a suitable structure for an NMDA antagonist. One possibilitys to use the backbone presented in Figure 3A; another one is to use the generic structure of the glutamate-site NMDA antagonists (Figure 2B). The latter group contains fewer biophores, but there are some insights of its mechanism of action and a structural analysis has been made for it . Hence, glutamate-site NMDA antagonists (Figure 2B) were favored as a structural prototype since some NMDA antagonists from the former group (Figure 3A) express antagonistic activity toward dopamine receptors (e.g. haloperidol). Glutamate-site NMDA antagonists can be readily derivitized. Thus the aryl ring (Figure 2B) can carry quite a large variety of substituents that enhance binding if they are hydrophobic . Since many good biophores were identified in the DA database we designed two different DA precursors (Figure 5) instead of one. This was accomplished by combining a few biophores into a single molecule. Each of these precursors has structurally close known homologues that are potent D2-type dopamine agonists. Proposed precursor molecules of DA database. Variant A (homologue of TL 224) is a result of merging biophores #11, #12, #15, and #16. Variant B (homologue of bromocriptine) is based on biophores #11, #13, and #14. When merged together in different ways, the prototype structures yielded a group of candidates. These compounds were tested "in silico" against all compiled databases (DA, MAO, and NMDA). Candidates with the best predictions were submitted for further evaluation of their pharmacokinetic parameters. Thus, they were tested against databases predicting plasma protein binding affinity , oral bioavailability and urine excretion (unpublished results). The metabolism of each candidate was then evaluated by the META program  using a mammal metabolism database. LogP values (logarithm of the n-octanol/water partition coefficient) were calculated by the MCASE program on the base of a group contribution approach . Possible side effects of the drug candidates were assessed by testing each candidate and its predicted metabolites against carcinogenicity and mutagenicity databases , . Evaluating candidate molecules by the predicted pharmacokinetic parameters (Table 4) we favored those with higher oral bioavailability scores and lower urine excretion scores. For optimal sustained action, we chose a plasma protein binding range of 50 to 90 percent. a LogP calculated by MCASE b Predicted Plasma Proteins Binding (%), concentration of the compound in a bound form devided on its total concentration in a blood c Predicted Urine Excretion (%), predicted amount of excreted drug relatively to its concentration in a blood d Predicted Oral Bioavailability (%). e Warnings reflect potential mutagenicity or carcinogenicity of compound. Compounds with warning level higher than 1.0 were considered possibly harmful. The four finalists shown on Figures 6 and 7 received the best overall prediction. Compounds III with X = O, Y = H and OH in position 1, and compound II with X = S and Y = H were selected as the most promising candidates since their predicted oral bioavailability was among the highest while the potential harmful side effects were predicted to be low (Table 4). Nevertheless, the entire group of compounds is proposed for synthesis and evaluation of their potential antiparkinsonian activity. Structural variation (changing X, Y, and the position of the hydroxyl group) can be used for membrane permeability adjustment, enhancement of oral bioavailability and improvement of Blood-Brain Barrier penetration. The best drug candidate compounds I and II, where X is O or S; Y is H or Cl. DA, MAO and NMDA biophores are shown with thickened lines. The best drug candidate compounds III and IV, where X is 0 or CH2; Y is H or Cl. The second hydroxyl is in the position 1 or 2. DA, MAO and NMDA biophores are shown with thickened lines.